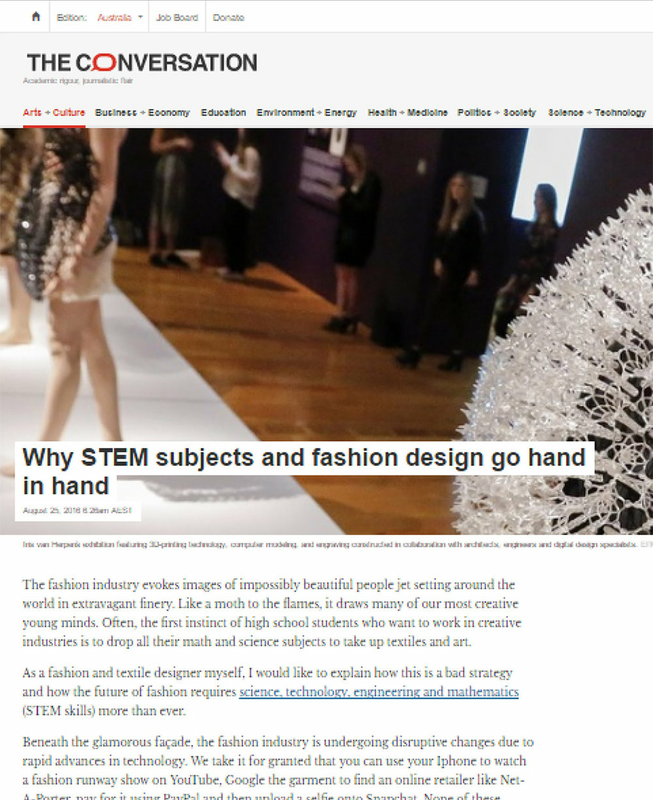 Liu, M. 2016, Why STEM subjects and fashion design go hand in hand, theconversation.com, weblog, viewed 24 August 2016, <https://theconversation.com/why-stem-subjects-and-fashion-design-go-hand-in-hand-63649>. Leslie, E. 2014, Maths and minkes: developing a formula for better maths engagement, newsroom.uts.edu.au, weblog, viewed 1 September 2014, <http://newsroom.uts.edu.au/news/2014/09/maths-and-minkes-developing-formula-better-maths-engagement>. Ham, M. 2014, Math passion is a simple formula, newsroom.uts.edu.au, weblog, viewed 18 August 2015, <http://newsroom.uts.edu.au/news/2015/08/maths-passion-simple-formula>. Mansell, J. 2016, Disruptive fashion, newsroom.uts.edu.au, weblog, viewed 1 August 2016, <http://newsroom.uts.edu.au/news/2016/08/disruptive-fashion>.